Hanoi's Old Quarter is where you want to stay, both for the sights and the atmosphere. To be honest, there isn't that much to SEE, but the city felt like the adopted Asian child of Greenwich Village and San Francisco, which is to say it was awesome. There are fashionable boutiques, art galleries, restaurants, and more coffee shops than you can count, all amidst thousands of honking motorbikes and street stalls. 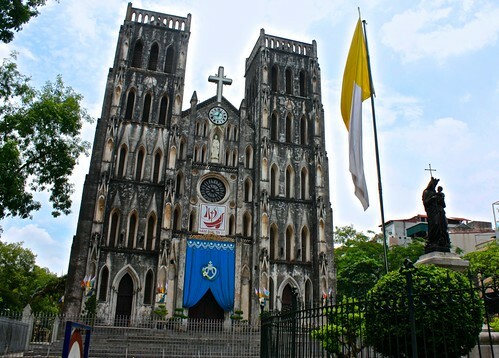 Just walking around is the best way to experience the area, with stops at St. Joseph's Cathedral, Hoan Kiem Lake, and the Opera House. The only "must see" sight in Hanoi is Ho Chi Minh, in the flesh. Preserved in the Ho Chi Minh Mausoleum approximately 2km out of town, the former President of Vietnam draws quite a crowd. He's starting to look a bit like a wax figure, but the number of domestic tourists who flock to see him daily is impressive in itself. 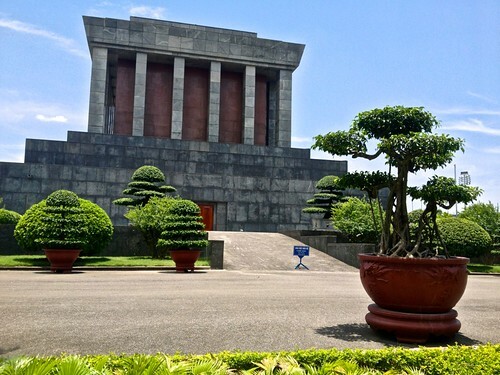 You can follow a visit to Uncle Ho with a walk through the Presidential Palace and his old stilt house (25,000D). If you want to see something beyond strange, visit the museum (25,000), which has post-modern and impressionist exhibits that are somehow supposed to illustrate how Ho Chi Minh saw the future of Vietnam. Let's just say that the curator would likely struggle to find a job elsewhere. The line can take over an hour, and the whole complex shuts down for lunch by noon. 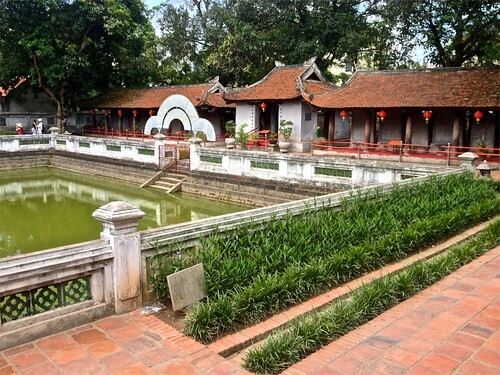 If you're aching for another "sight," take a stroll to the Temple of Literature. Open during lunchtime, this complex of buildings represents Vietnam's first university and is one of the oldest things you'll see in Vietnam, dating from the 11th century. It's not that impressive in itself, but for 20,000D (10,000D with a student ID), it's a nice place to spend an hour. We visited during graduation time, so the highlight of our visit was posing with countless students for their formal pics. One interesting fact about the Temple is that the former Emperor used to administer the admission tests himself, orally. Imagine taking the SATs live with President Obama and you'll get a sense of the pressure the prospective students here were under. Only the brightest scholars were admitted, and those who went on to achieve success had their names inscribed on the 80+ turtles that surround one of the courtyards. 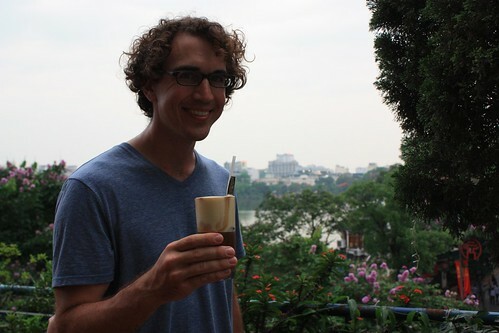 Most of our time in Hanoi focused on this endeavor. We saved a version of this article of the 20 things you need to try on our phone and used it to help us navigate the streets. There's literally food every 10 feet, so if you have no dietary restrictions you don't need to look very far. For a specific local dish, ask a local for a recommendation. Doing this at your guesthouse is sure to create quite a stir, as the locals who work there argue about their favorite place. Some must-try's are bun cha (the local pork specialty and available everywhere), pho ga (the famous noodle soup but with chicken instead of beef), regular pho (the place at 49 Bat Dan is the "best" place in town according to many), bun rieu (a tomato and fish sauce broth, complete with crab and tofu), ca phe trung (egg coffee, which you absolutely must have at Ca Phe Co, located at 11P Hang Gai), and, of course, more che than you thought possible (every street corner, though the comprehensive menu at 93 Hang Bac is worth a ponder). As long as you don't mind a meat-based broth, this gets you the dish minus the meat. It should also net you a discount off the regular price. 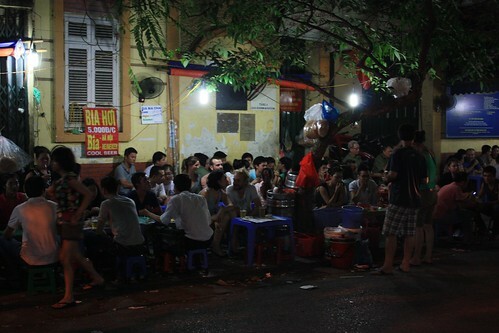 For drinks of the alcoholic variety, the bia hoi corner at the corner of Ta Hien and Luong Ngoc Quyen is the most popular place in town. Starting around 5pm, this quiet cobblestone corridor transforms into a 5000D/beer corner. Snap up a plastic stool and order a few glasses. Most places also have menus with food, though none of it is that great. The beer is "fresh," which means low alcohol content, so don't be scared to have a few glasses. If you prefer a real table, you can find places that offer 10,000D Tiger beers around the Hanoi Backpackers Hostel area (Ngo Huyen). 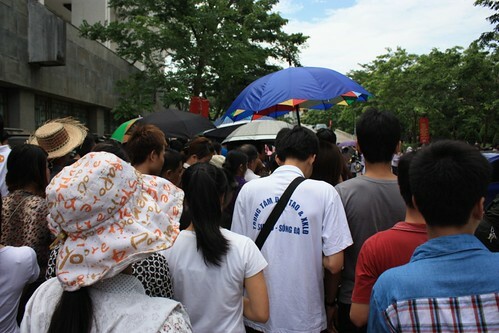 For dorm beds, most backpackers head to May De Ville Backpackers Hostel or Hanoi Backpackers Hostel. If you're looking for a private room, both these places have them, but they don't come cheap. $25 is your best bet, and that's if you're lucky to snag something. We walked around Hanoi, though you could easily get motorbike taxis for 10,000-30,000D. When it comes to leaving, you pretty much have to book your ticket with a travel agent. If you're doing a tour, note that you get cheaper bus/train fare for both Halong Bay and Sapa than if you purchase the transfer on its own. Hanoi was our last stop in Vietnam and mainland SE Asia, and from here we flew to the Philippines for some beaches, snorkeling, and rice paddy trekking. We saved close to $10 doing so, as our meter fare was almost double what we paid in advance! 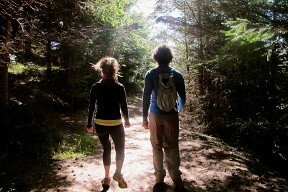 Interested in seeing the sights without paying for a plane ticket? 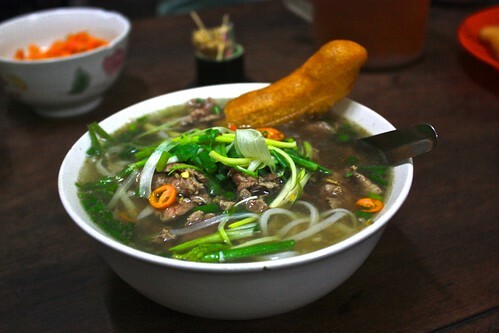 Check out our Hanoi photo tour. 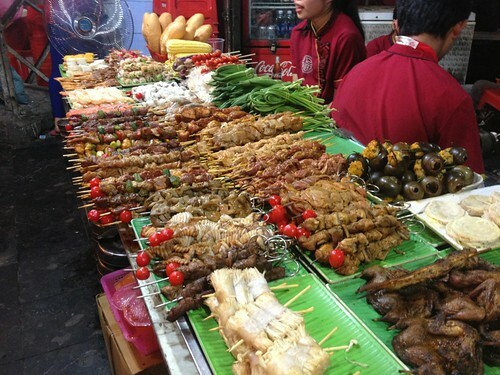 Do you have any budget travel tips for Hanoi? Let us know in the comments!